It was started from a simple idea about how to make my blog looks simple but contain many information. About how to make almost everything in the home page, just like a news website. We can see slider, headline news, what is new, and sort it by a specific topic. I was browsing, searching all around the google by many key words, then finally I got a html codes about how to make a recent post sorted in a specific label. It was so plain. No background, no any border, or any else. So I decorate it by using some CSS codes to get what I want, and everything is just like this. I finally got what I want after so many hard work for someone who does not know many codes. I think there will be so many people just like me out there, find for the same design, just like I want to. So, I think it would be better if I share it here, for you. 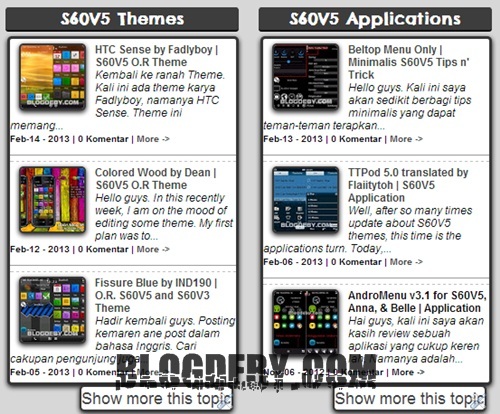 In this widget, I was customized the widget's title font and background for the whole blog. It was automatically there. You will not get it by the code I share here. Sorry dude. It need another effort. To apply this widget to your blog, you just need to follow these simple steps. Here it is. Login to Blogger -> go to Layout. Change POST NUMBER to the number of posting you want to be shown. For Example is 5. Change BLOG_ADDRESS to your blog address.For Example is WWW.NEWAFFILIANCE.BLOGSPOT.COM. It is easy and simple. You may customize the CSS codes as what you want. With this widget, you will bring all the latest update sort by the label in an interesting way if you can use it well as I did.